The perfect chart control for any ASP.NET application. A beautiful chart is often the essence of web page and can make all the difference between the visitor staying at the website or clicking away. Charts can make sense of piles of data at a glance and MindFusion.Charting for WebForms is the perfect tool to integrate them in a web application. The control supports all popular chart types - line, bar, pie and radar - as well variations of them - scatter, bubble, column, doughnut, radar charts etc. Each chart can have a legend, which is fully customizable, title and subtitle and can be 2D or 3D. Several input and output options are supported including XML, printing, image files. The control boasts strong design- time support with wizards, custom collection editors and data binding to name just a few. 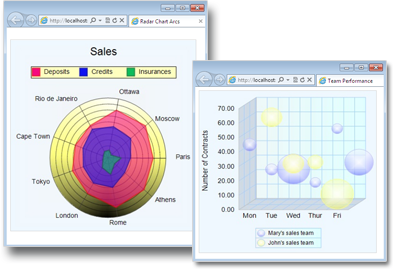 Charting for WebForms offers rich user interaction model with a number of behavior options for charts. 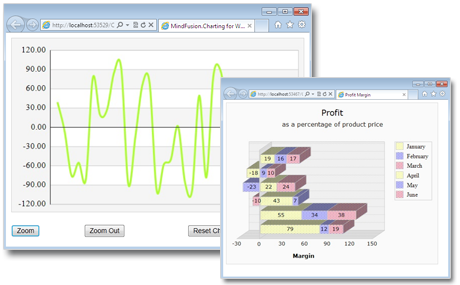 Zooming is possible for all types of line and bar charts, mouse events are raised when the user interacts with the chart. Drill down and dragging of data points are also possible. The chart supports delegates for easy calculation of mathematical functions. The appearance of the control is completely customizable - you can change literally any pen, brush or font that is used. There's a set of predefined themes to help you find quickly the perfect color scheme. Charting for WebForms offers built-in design-time editors for its pens and brushes that makes editing them fast and easy. The control can read its data from any .NET compatible data source as well data lists. There's no limit for the number of data series or the format of data - it can be any number or DateTime value. Data can be set through database. Data series may be different in length and type.